When looking for my next natural dye, first I look in the back yard, or in my surrounding environment then at the local farmers market/grocery store. After doing a lot of research about dye-able plants I figured out that hibiscus flowers yield dye. I have three large hibiscus bushes in my backyard so I started collecting. It took me a few weeks to gather the fallen hibiscus from my trees since they only drop about 5 flowers per day between all three of them. Thanks to the Phoenix Zoo (who has lots of hibiscus plants) I was able to double my lot after our recent visit, yes I picked up the zoo's dead flowers, but then I was ready to give it a go. So it was worth being the weird dead flower mom for one afternoon. Total Hibiscus flowers used in the dye pot. Flower placed in the dye bath. The brown areas is where the red drained into the vat. The red petals had yet to be submerged into the bath. Through my research the hibiscus flower was seen to produce a red/ purple dye. This is not what happened to mine. I'm not sure why the flowers yielded a brown colored dye. It's definitely a "pretty" brown, almost like it does have some red tones in it but it's not like what I've seen elsewhere. My only thought was that some of my hibiscus flowers were fresh and some were dried. I also collected many off the ground so they could have collected dirt or other substances that went into the dye. When researching some had mentioned that a hibiscus tea could be used. For this reason I thought the dried flowers would be ok but there is a possibility that this is not the case. 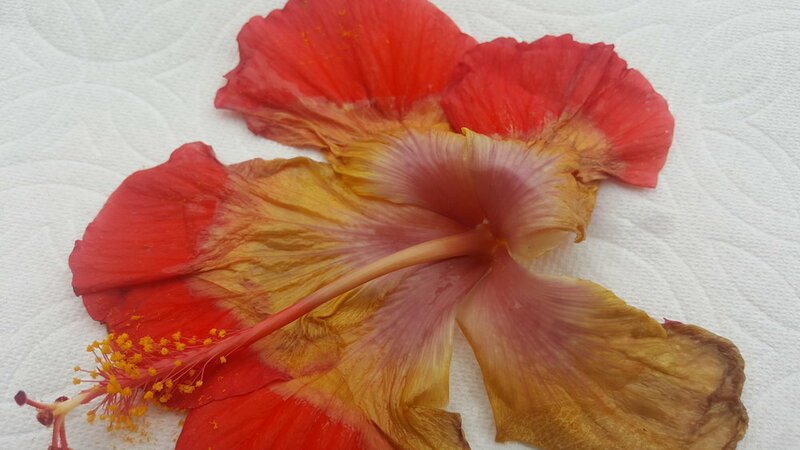 It would be interesting to do a new dye experiment and see what happens with only dried vs. only fresh hibiscus flowers. The colors are also varied throughout the mordant-ed fabrics. If you look at the top sample (linen/cotton blend) it looks sort of spotted. Some areas are more pink/red and others are more brown. I again, am not sure why this occurred. 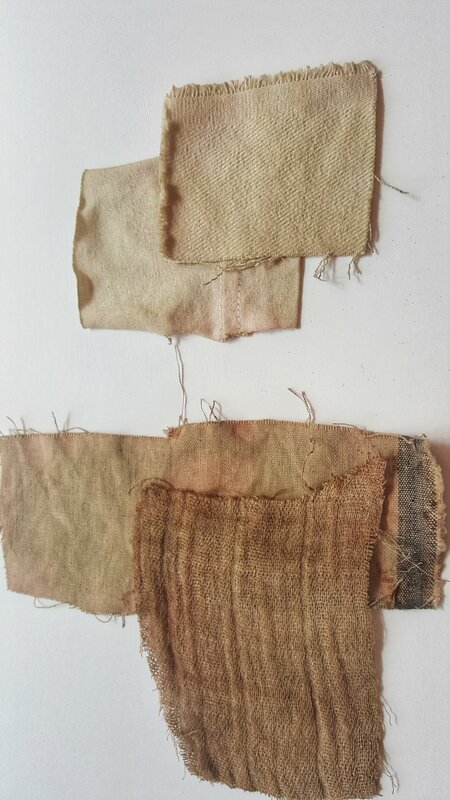 It didn't happen as much in the non-mordant- ed fabric samples so it could have something to do with the soya mordant.